By default, all columns in an E-Prime data file are displayed in alphabetical order within hierarchical levels (e.g., Session, Block, Trial, etc.). Due to the number of variables/attributes logged by E-Prime (both according to the experiment specification and automatic logging performed by E-Prime), the display of all columns may include a very large number of columns. E-DataAid, therefore, provides methods of limiting the display of columns to those desired (i.e., through arranging, hiding/unhiding columns). Once the desired layout is achieved, E-DataAid provides a mechanism on the main interface toolbar to save a “Column Definition” that may be reapplied when loading the data file at a later time. The Column Definition feature serves as a quick method to return to the desired display/arrangement of attributes within an experiment file. The commands associated with use of Column Definition files are located in a dropdown menu on the main toolbar within E-DataAid. Listing of up to 10 unique and most recently applied files. Displays the Load Column Definition File dialog to allow the loading of a .cd3 file. Displays the Save Column Definition File dialog to allow the display definition to be saved to a .cd3 file. Displays the Arrange Columns dialog to permit the display and order of individual columns. Displays all currently hidden columns, maintaining the order of the files included in the Column Definition file at their original level (e.g., block, trial) within the data file. 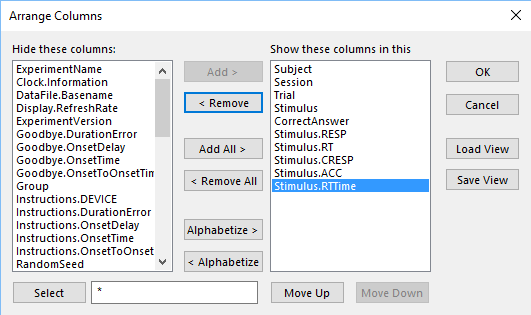 Displays all columns in alphabetical order within original hierarchical levels (i.e., Session, Block, Trial, etc.). To create a Column Definition file, first arrange the display as desired by hiding/unhiding individual columns (see E-DATAAID: Hiding/Unhiding Columns ), and/or by arranging column order (either manually or by using the Arrange Columns dialog -- see E-DATAAID: Arranging Columns ). From the Load Column Definition dropdown menu, select the Save Column Definition… option to display the Save Column Definition File dialog. By default, the root name of the data file (i.e., the name of the data file prior to the first “-“ and subject/session information) is suggested as the file name, and the file is assigned the “.cd3” extension. Click the Save button to save the display definition file in the same folder as the data file. Upon opening an E-Prime data file, the E-DataAid application will search the current folder and up to ten parent folders (if existing) for a .cd3 file with a filename matching the root filename of the data file. If a matching .cd3 file is found, the column definition is applied, and the name of the .cd3 file is displayed in the Column Definition dropdown menu field. 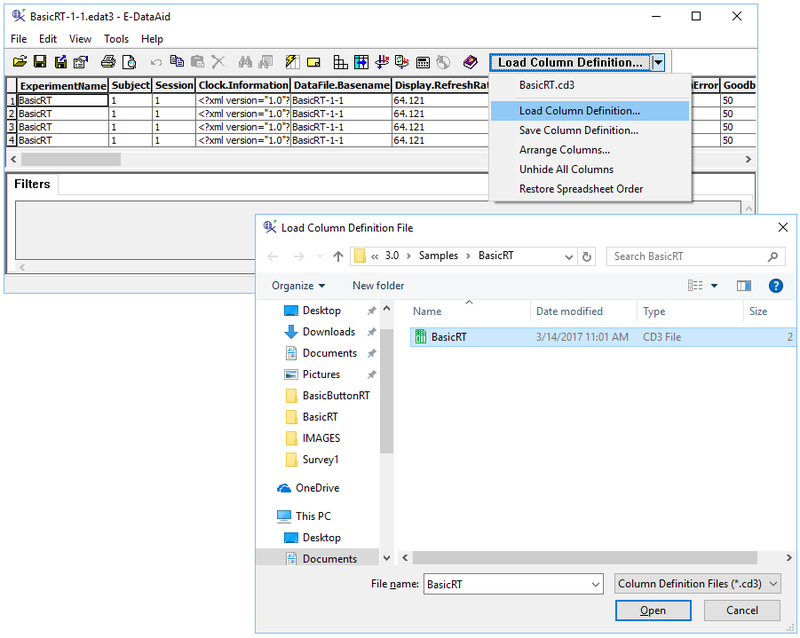 If no .cd3 file is found, no column definition will be applied, and all columns within the data file will be displayed according to default column order. A .cd3 file may be applied manually using the Load Column Definition… option from the Load Column Definition field. · If the Column Definition contains a column that does not exist in the data file, that column is ignored (i.e., skipped), and the remaining columns are arranged in order, according to the file definition. 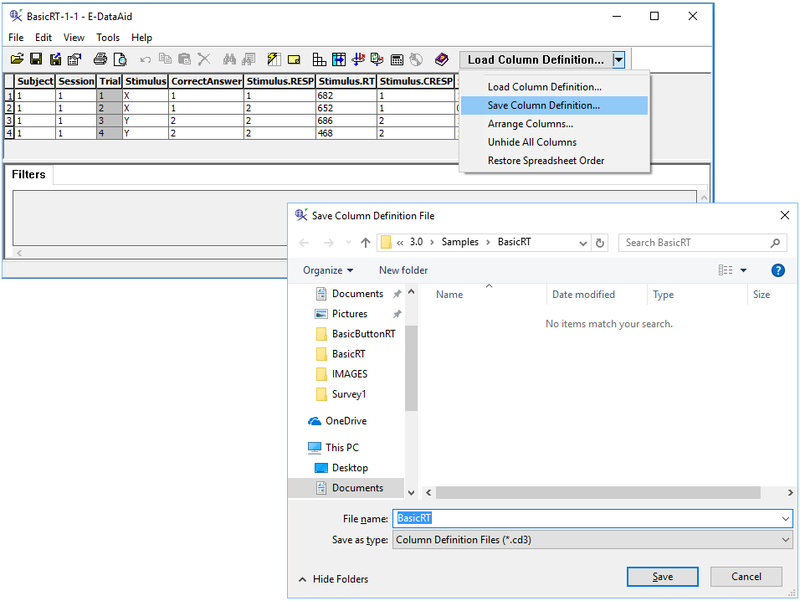 · If the data file contains a column that does not exist in the Column Definition file, that column is treated as visible and is repositioned to follow all of the columns that are included in the Column Definition file. · If multiple columns are missing (from the .cd3 file), those columns will be repositioned following the columns included in the Column Definition file, and will maintain their original, unfiltered order (alphabetically within level). To remove a column definition from a data file, use the Unhide All Columns or Restore Spreadsheet Order commands to display all columns within the data file. The Unhide All Columns option will simply unhide all hidden columns without adjusting the order of the columns (i.e., the order from the column definition file is maintained). To return to the original order of the columns (alphabetically within hierarchical level), use the Restore Spreadsheet Order.